Shanky Technologies Poker Bot Support Forum | General Category | Marketplace: Profiles | Topic: *New Price $19* EndGame 6-handed and Full Ring Cash Profile 0 Members and 1 Guest are viewing this topic. EndGame is a positionally aware cash game profile that adapts to both short-handed and full ring tables. Thousands of lines of code are dedicated to both table formats to ensure that the profile adapts to both types of tables. The code centers on strategies for full ring games and situations in which the opponents drop below 6. Sitting at a short-handed table will automatically invoke code designed for short-handed play as well as the number of opponents dropping in a full ring game to less than 6. User-defined variables are used throughout the profile. Not only do they govern the opponent count and the number of orbits in a round, but they are also used on each and every street to build upon each other for sophisticated bluffs and float bets. EndGame is based largely upon random variables. By doing this, it increases the likelihood that the profile will be able to remain on a single table for hours at a time and not become too predictable. Obviously hand ranges and overall strategies remain fairly stable throughout, but limps, raises, 3-bets, squeeze plays and bet sizes will vary slightly based on position and opponents' actions/position. Consideration has also been given on several streets to combat the plays that opponents typically attempt when they are semi-aware that they may be facing a bot. I have been told by at least 1 tester that it quite simply does not play like a bot. With this purchase you will also receive access to the forum. Admittedly it is just in its infancy as far as it being an asset, but that should rapidly change as new members join. The idea of the forum is to specifically exploit the opponents of each particular site or blind size by adapting the profile to that site. This will be done with the use of text that I will code based on the feedback of that forum. Rest assured, that does not mean this profile needs this kind of extra coding, it simply conquers the problem of trying to play the typical opponent on one site without sacrificing winnings on another. Quite frankly, the profile was designed to play at Bodog (for my personal use) and winning on iPoker requires a slightly different approach. Cake also provides some unique and exploitable characteristics that I just do not feel comfortable doing on the other sites. These texts will always be optional and coded by me to ensure they fit in seamlessly with the rest of the profile structure. iPoker- Since I know this is the question on most people's minds, I will answer it as honestly as I can based on the results of my testers. As the profile sits today, it plays even or slightly winning poker at both NL2 and NL4 tables. Two testers that have been dedicated to this site have played even poker on these stakes with 1 of the testers playing winning poker. Advice has been given to me about how to start raking in additional pots and limit our losses in others on that site alone, but they are not strategies that I would like to see on some of the other sites. This type of approach is the same that took this from a mediocre profile to winning with regularity on other sites. So as is and without text additions, we are holding our own on the sites and enjoying the profits that rake back provides. NL10 on this site has not been fully tested in its latest versions, and not out of fear of losses, but rather I have released the testers from their servitude and they have flocked to sites that are showing huge profits (with 1 tester having a pretty good run on limits higher than I have ever touched with a bot). Specifics- I am purposely being very vague about the overall strategy of he profile. This is for the sake of purchasers. I will be more than happy to answer any specific site, strategy, or profits related to this profile by pm or email. I have no problem telling you how it may play in any given situation, but I feel this may a bit too much for a public type forum. I am sure investors and potential buyers can both appreciate this. Testers- Please contact any of them for their opinions, assessment, or feelings on the profile. I would prefer if it is more than just a general type question that this be done in other means besides publicly. All of them are using this profile as their own in some capacity now and I would prefer to keep the profile's exact plays in spots confined to a tighter group. A simple email or pm to me or a tester will get those types of questions answered. The text will be sold in Text format. *Purchasers of this profile automatically receive the latest version, and all updates for, my tournament profile Revolution. Hi congratulations for the profile, the profile play in bodog limits 0,5 0,10 0,25? The graphs are all from 6-handed NL10. There are no other limits included in this. NL 5 plays very well but is horrible for bonuses and rake back. I personally usually play NL 25 and another tester was quite impressed with NL 50 (at the most peak times and a small sample size on these higher levels of course). I would highly encourage people to mostly stick to NL10 though if your bankroll allows it. The tables are much easier and it builds rake back and knocks down bonuses rather quickly (especially when playing 6-handed). I can confirm that this was me. I won't be giving out details, as it's quite easy to get on poker table ratings leaderboard with this profile. For all but the unluckiest it should pay for itself and be in profit on Bodog 6max within a week max at NL5 / NL10 with current game quality. Have you tried turning it off, then on again? This looks pretty nice. Good job mate. Are you a Megadeth fan? is ppl or txt format? He says what format it will be sent in in the first post. He just didn't specify whether it will be computer ID locked or not. Thank you. It is actually more of an homage to Rise Against, although I'd like think the name probably has a bit more meaning than just the title of an album. It is sold as ppl and a computer ID is needed. It will be locked for a particular computer as this is probably the most fair way to proceed. Updates and the optional EndGame forum support are also given at no cost. I did not mention updates because I would hope most purchasers assume this to be true, but it probably should be mentioned just in case. Hi Aenima! Payment sent. Please check your email. I actually sold a few more at the starter price than I had intended to sell before I was able to check the computer. I will of course honor all of these sales. The price has gone up a level for future sales however. I have addressed every pm and email. Everybody that purchased should have a profile in their inbox. If this is not the case for some reason please email me. Good luck on the tables. I would encourage feedback and comments more than graphs though. The testers and I have posted graphs, and the testers have more forthcoming in the journal soon. We want to explore each site, each stake, and each table type individually to see where we stand. I would rather see users just give their feelings and not information that could compromise their screen names, but they are still welcome to send me or my journal the graphs if they so choose to. I have 1 profile left at the $149 price. I might not have access to a computer for the next 8 hours or so if it remains that way until I get back, all sales would be honored. Once it is increased, it will remain at the higher level of price. For those on the fence rest assured, I do plan on keeping at the $199 price much longer than the first two prices. Those were just to give thanks to the people that are trusting a first time seller. Thank you to all of you buyers that took a chance on a relative unknown coder. I appreciate this greatly. The profile price has been raised accordingly. I encourage other people on the fence with this to contact myself or other testers for more specific and updated information regarding sites and success, or just to find out how this is different from other profiles. 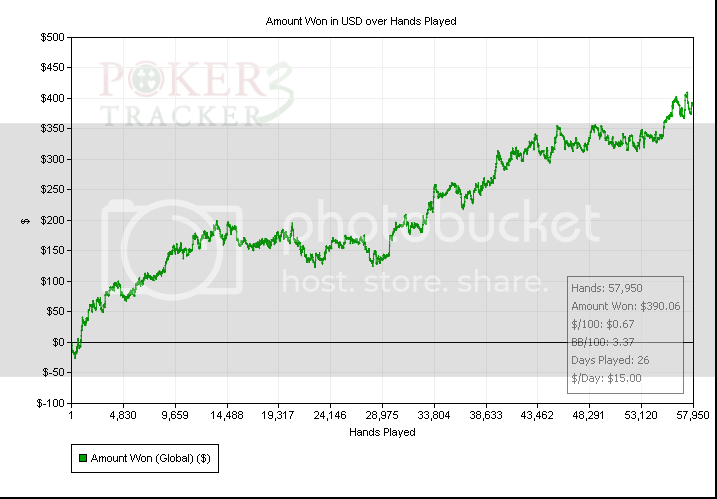 I posted an iPoker graph for NL2 at the top of the page. It is an updated version of the one in the journal and does not include his rakeback which was somewhere just below $10. It will have more hands played as is and then the tester has said he is going to increase in stakes to see what it can do. He has expressed his opinion to me about how impressive some of the plays of the profile are, but I will keep the specifics of these plays between owners of the profile and more private correspondences (via email or PM). This is in direct response to those who are asking me if it is a Bodog only profile. It is not, that is just the only site where I play much, much higher stakes on so the results are a bit more eye catching. 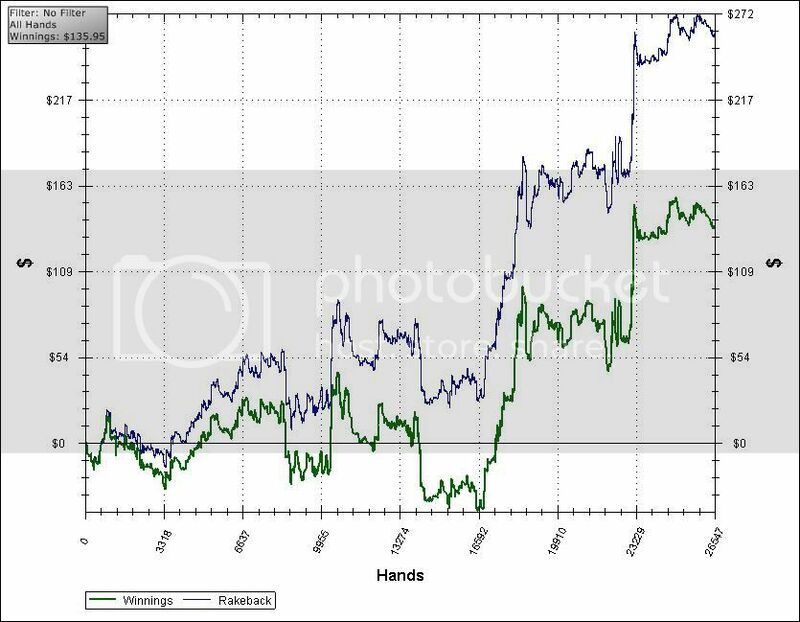 I have an iPoker graph up top, and both UB and Cake have both been successful with smaller sample sizes. Now is a great time to be running Bodog. Hopefully everybody has opted in to the Punta Cana bonus currently offered on this site. It is worth $150 over its duration and I have already cleared mine with ease. Here is the link if not. This is a great time to use or buy any profile that you have been looking at. It should easily pay for itself 1 time through with this bonus alone. Good luck and happy botting. By the way, I no longer bot on stakes any lower than NL25 at Bodog. I dont really want to play at Bodog considering the current USA situation. Have it been tested for nl10 6max on iPoker? I have addressed this more fully in personal messages but I don't like leaving a forum question unanswered, so here goes. EndGame, as is, is breaking even on iPoker at NL10 6-handed. I don't want to give the full details out to protect the screen name of the botter, but it is a small sample size, around 5k hands, and the rake back has been a very nice profit in his account. I am currently importing hand histories from other players since I cannot play this site and fully expect a slightly modified version to come out of all of this. This is not unexpected since all of the testers wanted to change a few things during testing but I felt them counter-productive to all of other sites. The result is something slightly altered for iPoker alone. I am encouraged though that we are already at break even up there since it seems that this has been a challenge for a lot people. The rake back deal is quite lucrative. I will not be making any additional money on a tweaked variation of this profile in case the current or prospective buyers are curious. $30+ on iPoker 6-handed over the last 1-2 days not counting rake back. This is using a text attachment in the EndGame forum that slightly alters the original profile for iPoker (forum members know what this means). Hopefully graphs will be posted soon so we can dispel this Bodog only myth that seems to surround this profile as well as debunk the theory that bots can't win at iPoker.